GWN, I don't know the name of the treatment, but I will find out next week when the Dermatologist office is open. I know it was covered by Medicare (65 and older) and is approved for once a year, so it is considered a valid treatment for precancerous areas. It is only done in the winter when sun exposure can be kept to a minimum. Marie, That poor mom to have it on her nose. +1, Sanderson! I feel really bad for her. Thursday I had the PDT treatment again after 3 summers of gardening. I bought the sun protection sleeves for cleaning up the prickly melon and squash vines and bought this sun protection fishing hat at the same time. There is a large back cape but I removed it for ease of use. It reminds me of a burka and I will tell you it is hard to walk in unfamiliar terrain. Thanks for posting the photo and bumping the thread. I've put a note to get a similar hat next time I go on an online shopping spree (I try to wait so that I buy enough at once to get free shipping.) My current hat is pretty good, but there are times I could use more protection for my face and neck. I hope it's small enough. Adult small hats are typically too big for me. But that means I get to wear fun kids hats in the winter! I always wear my wide brim hat and black long sleeve sweatshirt when I go out to work in the garden. It's hot to work in, but the fading on the sweatshirt tells me I'm doing the right thing. I have a sunblock shirt, but something about it seems to concentrate my sweat, and after a few hours it stinks like no other piece of clothing I've ever owned. I imagine the sun protection fades with washing. Do others have this problem with sun-protection shirts, or is this just a... special feature of mine? I'm 71 yrs old and remember my mom telling me to go outside and play in the sun. They just didn't know any different back then. I get about 6 moles on average taken off each year due to the moles looking abnormal to the dermatologist. About 3 each year come back with abnormal cells. Some have had to have further surgery to remove the skin farther below the mole and further around the mole. So I am very experienced with this problem. My experience has led me to believe some of this is due to heredity. My whole family has the same problem. Lots of moles and some looking abnormal enough to have removed. In the past month, my daughter, my sister and my self have had a total of 15 moles removed due to abnormal looking moles. Out of those removed, 4 have had to have further surgery to remove larger areas of skin and tissue. 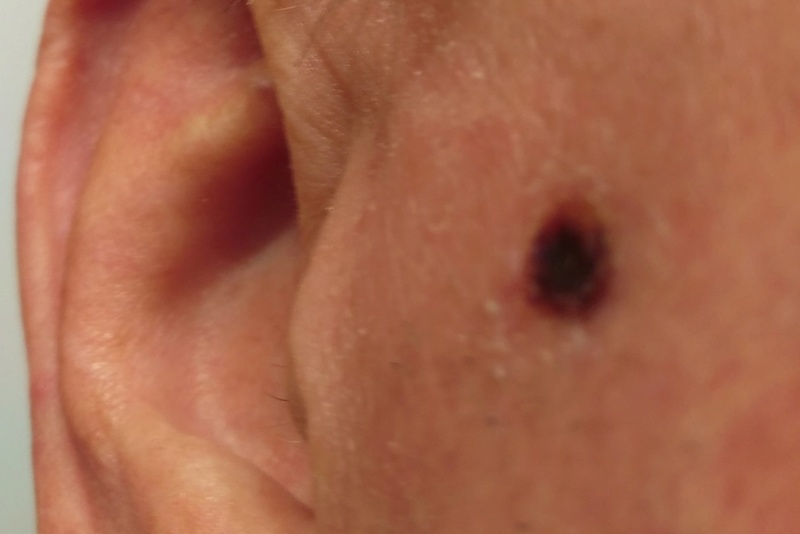 Some of my moles that have been removed are in areas that have never been exposed to the sun so I am not sure how beneficial blocking the sun on those of us with family history of precancerous moles. 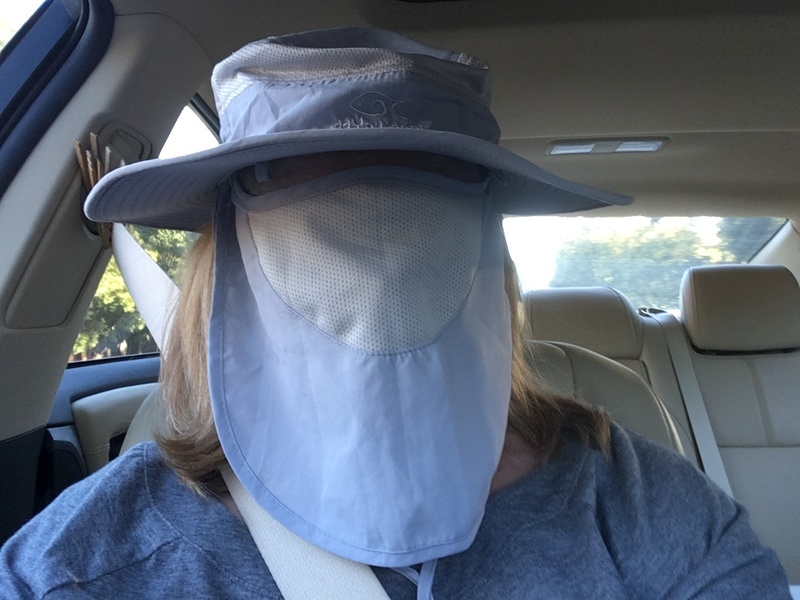 Of course I am probably wrong because all the medical dudes advise wearing all sorts of sun blocking paraphernalia. Is that white mesh actually over your eyes ? If so ...if the white mesh was replaced with black mesh you'd be able to see a lot easier . All of my beekeepers suits had black face pieces after i discovered by chance that black was easier to see through looking from the inside to the outside as it absorbs light rather than reflect it into you line of vision . @sanderson wrote: Thursday I had the PDT treatment again after 3 summers of gardening. I bought the sun protection sleeves for cleaning up the prickly melon and squash vines and bought this sun protection fishing hat at the same time. There is a large back cape but I removed it for ease of use. It reminds me of a burka and I will tell you it is hard to walk in unfamiliar terrain. Plantoid, When worn properly, the eyes are above the mesh. A pair of sunglasses would complete the facial coverage. I wore it this way just to make it home after the process. Don't worry, Ken drove! I purposely bought this light blue color so I wouldn't bake in the sun. Reminder to get your summer sun protection in order, hats, sleeves, and sun screen. Last week I had the annual whole body checkup for suspicious moles/spots at the dermatologist's. A small mole on my back was biopsied. Today, I had a sizeable wedge cut out of my back for "in suti" melanoma. Like Stage 0 cancer. A 1 cm spot is now a 7-8 cm suture line. @sanderson wrote: Reminder to get your summer sun protection in order, hats, sleeves, and sun screen. carcinoma removed from my neck a few weeks later. PROTECT YOUR SKIN. Take care of yourself, Sanderson, and keep up the doctor visits for skin inspections. Early detection is the key! 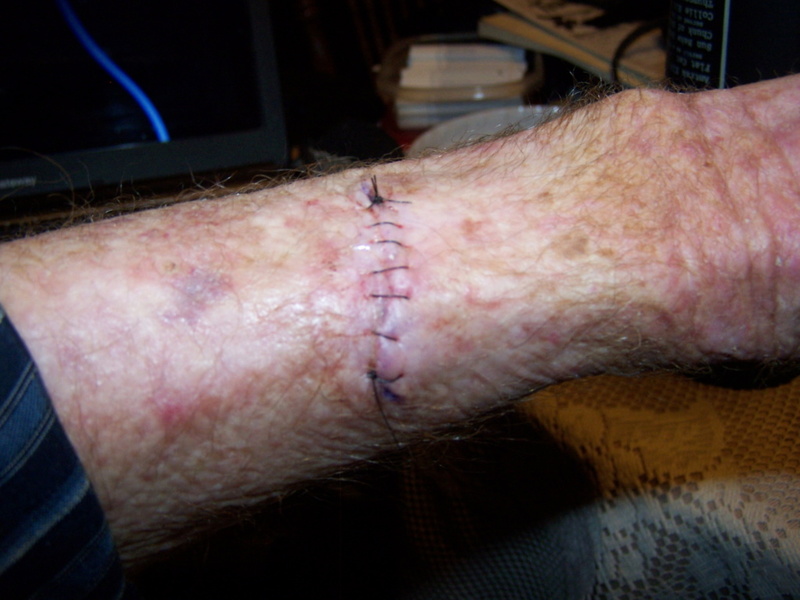 I have had a number squamous cell carcinoma patches removed over the years, and have regular whole-body skin checks to ensure we keep ahead of them. Having been raised on a farm where a lot of summer days were spent in the fields without a shirt, the skin took a lot of abuse and I am now paying the price. Sanderson, I'm so sorry to hear about what you are going through. The early detection is good. Hope your recovery goes well. OG and MrBooker - Ouch! Just years of sun exposure. MB, as a trucker, was yours on the left arm? As a California blond, I spent lots of years working on my tan. I'm supposed to take it easy for a couple weeks so I don't pull out any stitches. I'm going to milk it for all it's worth! I had to help Ken after his two shoulder surgeries. It will be heaven to have someone wash my back - Calgon moment. @sanderson wrote: OG and MrBooker - Ouch! Just years of sun exposure. MB, as a trucker, was yours on the left arm? As a California blond, I spent lots of years working on my tan. Yes, on my left arm between my wrist and elbow. Ive had surgery on my face, hands, neck, jaw bones, ears and arms. Just when I get one cut out, another one pops up. When I was a kid, I had really severe sun burns. Even the tops of my feet got burned from going bare foot. Younger folks should protect themselves from to much sun. They won't notice the damage now but when they get older.... WATCH OUT. @MrBooker wrote: . . . Younger folks should protect themselves from to much sun. They won't notice the damage now but when they get older.... WATCH OUT. So true and so hard to convince a youngster that they will some day look like us! I go to the dermatologist every three months for a full body scan. I was told that I will never have major problems like skin cancer if they catch the growth early, therefore the every three months scan. It also turns out that sun exposure is not the only thing causing the problem. It is also either hereditary or you have a propensity for the growths. Every one in my family has massive amounts of moles (most are flat) and we all are having the full scans every three months for this reason. I have had precancerous growths removed from parts of my body that have never seen the light of day. Yolos! Good thing you go 4X year. [quote=When I was a kid, I had really severe sun burns. Even the tops of my feet got burned from going bare foot. This was done Thursday, 24th. Basal Cell. They also found a Squamous Cell on my neck and will remove it next week. Gardening is a summer time hobby and it's difficult to stay out of the sun but we MUST protect ourselves. That's a big scar! Mine is 4" with 21-22 stitches. And cuter! I have to have more tissue removed on Tuesday as the margins weren't clear. @sanderson wrote: That's a big scar! Mine is 4" with 21-22 stitches. And cuter! I may be wrong but I think some of us are considered a cash cow. Each time I go back, it's from $200 to $400 for a followup but we can't take the chance. @MrBooker wrote: This was done Thursday, 24th. Basal Cell. They also found a Squamous Cell on my neck and will remove it next week. Gardening is a summer time hobby and it's difficult to stay out of the sun but we MUST protect ourselves. As they say on reality TV, "That's gonna leave a scar!" I have a matching scar on my right arm from years ago, and have had several Squamous Cell growths removed from my neck and back since then. The unfortunate thing is that we can now wear the correct clothes and use the right sunscreens, but the growths keep showing up from damage we did 50 or 60 years ago. If I'd known that I was going to live this long, I would have taken better care of myself! On the 21st, I had one removed from the side of my face, and the lab report came back as Basal Cell carcinoma. Ah, the sins of our youth! Thank goodness for medical advancements. Unfortunately, that clothing & the high # sunscreens weren't available back when we were kids & young adults. My mom's solution was to just stay out of the sun. And her skin is beautiful. She certainly doesn't look her age! I'm a sun lover, so it's much harder for me.